As a continuation in our series on the anatomy of the spine, this article focuses on the anatomy of the lumbar region. The lumbar region of the spine is below the thoracic region. It is located between the ribs and the pelvis. There are five vertebrae in the lumbar region of the spine in most humans. Starting at the top these vertebrae are called L1, L2, L3, L4 and L5. L1 is the top-most lumbar vertebrae. It sits just below the twelfth thoracic vertebra, T12. As you travel down the spine you get to L2, L3, L4 and L5. 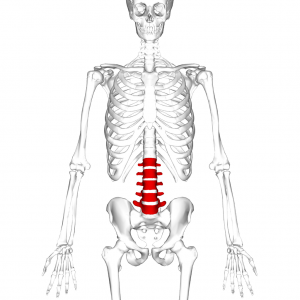 L5 is located where the spine meets the pelvis. Thus far in our series on the spine’s anatomy we’ve talked in generalities about the number of vertebrae in each region of the spine. However, the number of vertebrae in each region can change from one person to the next. The cervical region of the spine is most consistent. But, as we move to the thoracic and lumbar region we start to see more variation. The lumbar region of the spine typically has 4-6 vertebrae, with most people having 5. There are five lumbar nerves. As with the other spinal regions, the nerves are named after the vertebrae they emerge next to. For example, the lumbar nerve L1 emerges from the spinal cord above the vertebrae L1. The lumbar nerves control the movement of the thighs, lower legs, ankles and feet. In addition, the L1 nerve also works with the lower thoracic nerves to control the abdominal muscles. Stay tuned for the next part in our anatomy series as we travel down the spine to the sacrum and coccyx.